The TASER® Advanced M26c is equipped with many great features, including a safety switch, integrated laser sight, low battery indicator light and more. The TASER® Advanced M26c fires two darts discharging 50,000 volts, at 26 watts of power, 15 feet and has the equivalent stopping power of a high caliber hand gun. Most law enforcement personnel consider TASER® devices as the best non-lethal protection for your home, business and automobile. TASER® M26c devices provide the ultimate EMD TASER® technology for law enforcement and civilian personal protection. The TASER® M26c is a product designed for personal and professional protection. Discharging 50,000 volts at 26 watts, the TASER® M26c can neutralize even the most aggressive combatants. The TASER® M26c is a self-defense electronic control device or "ECD". Electronic Control Devices fire two darts, connected to 15 feet of insulated wire, to paralyze the central nervous system. The TASER® M26c uses replaceable cartridges that contain compressed nitrogen, to propel two darts that are attached to the TASER® M26c by insulated 15 feet wires. The TASER® M26c transmits a 50,000 volt electrical shock through the wires and into the body of the assailant, taking control of the central the nervous system. The shock can penetrate through two inches of clothing. The key technology to disable even the most aggressive assailants, the TASER® M26c temporarily overrides the central nervous system to paralyze muscles. This TASER® technology diliveres the shock in a more effective manner than other self-defense stun technologies. A good way to describe this technology, is the electrical "pulses" simply hammer the assailant to the ground with many consecutive pulses. A replaceable cartridge that disables assailants from 15 feet away. These cartridges include a nitrogen propulsion method, two 15 feet insulated wires, and two probes. Compatible with all the TASER® M and X models. A system to hinder misuse with enhanced accountability, The anti-felon AFID system includes bar-coded serial numbers inside each cartridge and spreads confetti ID tags when deploying the unit. Optimal laser synchronized with on/off switch. 8 AA Duracell batteries available at many local retail stores. Good for up to 30 deployments, before new batteries are needed. Low battery indicator light on back of unit. When red indicator light stays on consistently (no blinking), the batteries are running low on power. The unit is good for 1 or 2 more deployments, before batteries need to be replaced. Should the light not come on at all when powering the unit up, replace batteries immediately. TASER® stun pistols are the only self-defense product that enables you to take control of you and your family's security, as they will incapacitate even the largest and most aggressive combatants. Safer and much more effective than other self-defense options, such as pepper sprays, which require potentially unsafe chemicals or direct contact stun guns that require being close enough to actually touch the assailant. These products usually prove to be less effective on assailants that have been drinking alcohol or using drugs. The TASER® M26c is considered as one of the best non-lethal choices by law enforcement throughout the United States and the world. It provides a 5 second shock with one pull of the trigger. Multiple shocks can be administered when the darts are still connected to the assailant. This will disable attackers and give you plenty of time to get away to safety. Unlike other individual self-defense products which require you to be near the target, TASER® products are reliable from 15 feet away. This keeps you at a safe distance. The TASER® M26c has actually been developed for easy use, even in extremely stressful circumstances. Power up the laser with one flip of the on/off switch. The TASER® M26c permits you to respond quickly and effectively to any threat. 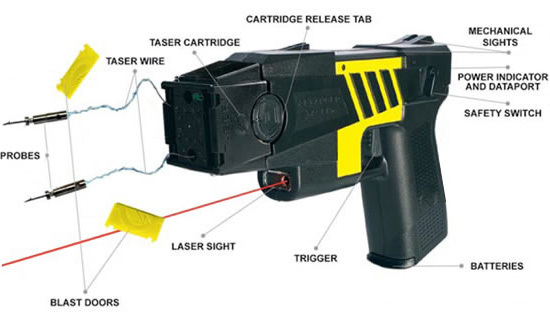 The TASER® M26c is not considered a firearm. It can be legally carried in most states. They are restricted from citizen use in five states including HI, MA, NJ, NY & RI. To view a "Law Statutes Summery" on the possession and use of the TASER® M26c in your area (law enforcement and consumer), click here.